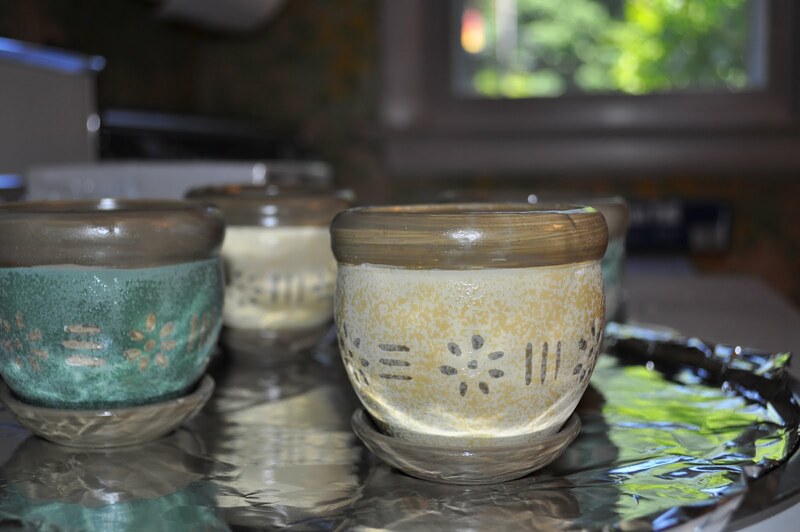 Candle making is a fun hobby although I am hoping to sell them. 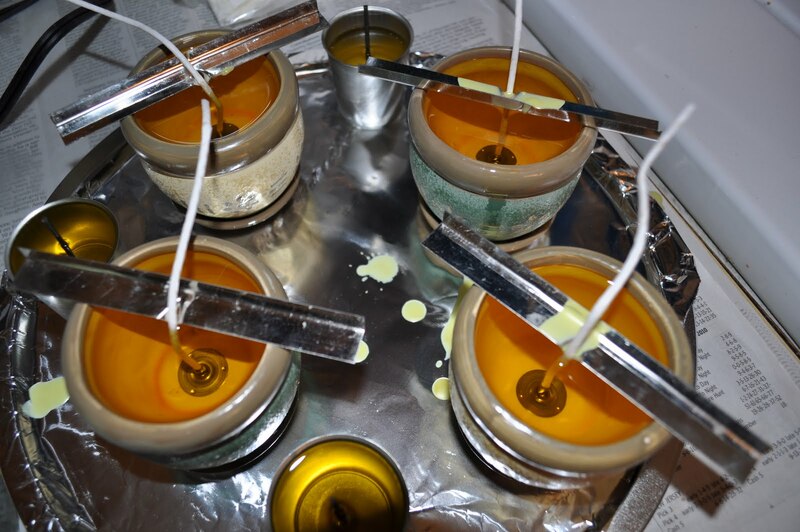 Here is how I make candles. This particular day I made Citronella candles for the patio. 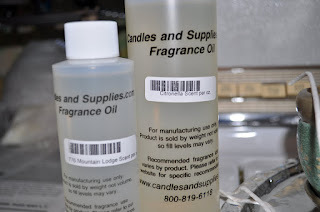 Along with the Citronella scent I also added some Mountain Lodge which is a combination of cedar and evergreen scents. Smells very outdoorsy . Next I get the containers ready that I am going to use. Since they will be used outdoors I purchased some cute ceramic containers. I used a hot glue gun to secure the wick to the bottom of the container and to keep the wick somewhat straight I use a metal wick holder. Next I get the wax ready. 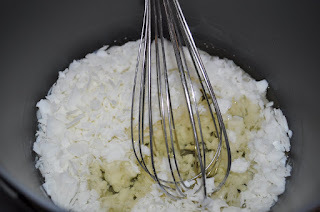 There is a variety of wax you can use but I have chosen to go with soy wax. It is a cleaner burning wax. 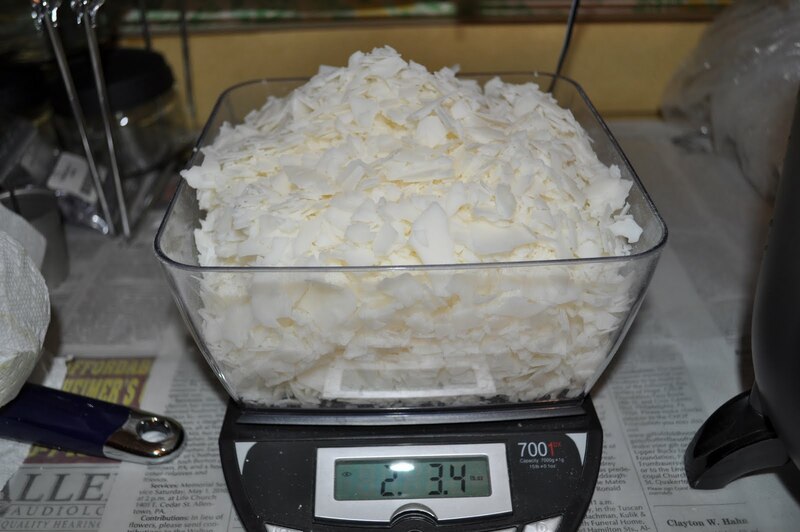 Now you need to weigh the wax out based on the size of the container you use will determine how much wax. 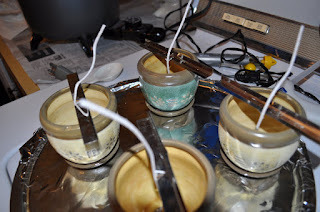 I'm still learning this part so I usually end up making extra votive candles. 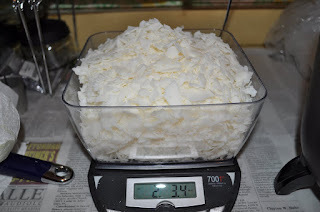 To make these candles, the containers are 5 ounces and I used about 2 1/4 pounds of wax. I did use too much which caused me to make 3 extra candles and I made votive ones. Now you need to melt the wax. You can use a double boiler however I use a slow cooker. I purchased one just for candle making. Imagine what you soup would taste like!! 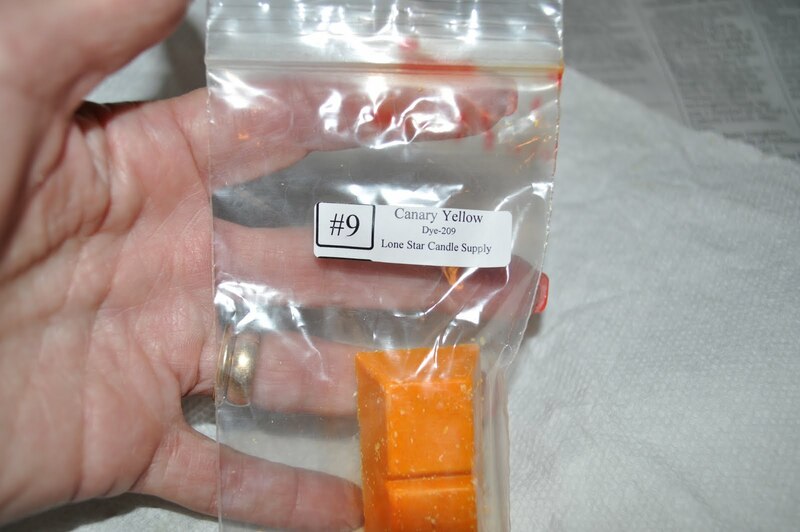 After the wax is melted you then add your color. 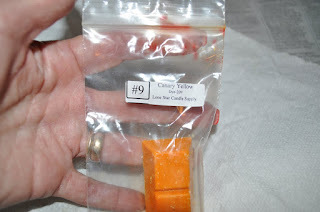 I used canary yellow with this batch. Your color comes in a variety of ways. It comes in blocks, flakes, liquid and I'm sure other ways which I have not yet found. But don't worry I'm sure I will. You also add your scent at this point. The tricky part that I am finding is getting the wax to the range of temperature to pour it into the containers. Then you wait for the wax to set. It's like watching paint dry. My problem is wanting to remove the metal wick holders and when you do that well then you have another host of problems. Like craters and holes in the wax. So now I have to tell myself WALK AWAY AND DO NOT TOUCH. I am getting better. This batch came out really good. I didn't touch them until the next day. After they are totally set I then remove the metal wick holder and cut the wick down to size. You can buy different lengths of wicks and wicks made of different material based on what type of wax you are using. So along with making jewelry I have added candle making. I hope I was able to give you a quick lesson in candle making. Enjoy your day! Where did you learn to make so many differnt types of candles? The holders for your citronellas are very classy. I be proud to show off those. I hide the ones I have now. I love your candles! You are one talented Aunt, if I say so myself! With all the rain we are getting this spring, I will need a boat load of citronellas before the end of summer! What a great tutorial! Thank you. You should try to sell them, they look great! Wish you lived closer I could use some for the weekend! Awesome tutorial! I'm notoriously impatient, so I'm not sure I could walk away and not touch, but I may give this a try sometime!